Iconic Australian artists. 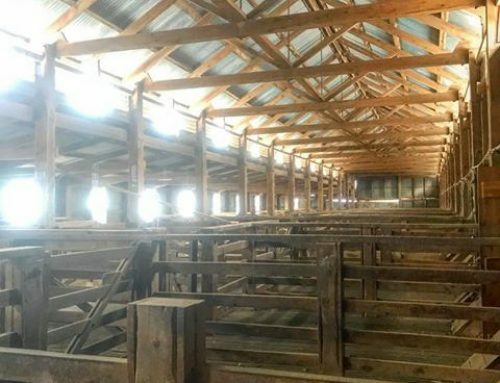 The phrase makes me think of idyllic portrayals of pastoralism, of golden fleeces suffused with sunlight, frontier settlers framed by eucalypt trees and the blue haze of a never-ending landscape. There are also the confronting depictions rendered by more contemporary artists. Of men and women, their communities, and their profound connection to the lands beyond the mountains. The bush. Pro Hart was a legend of the land and the canvas. 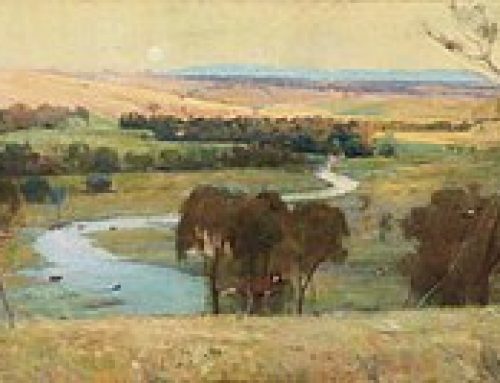 He was not only an iconic artist, but through his work became a powerful advocate for rural Australia. 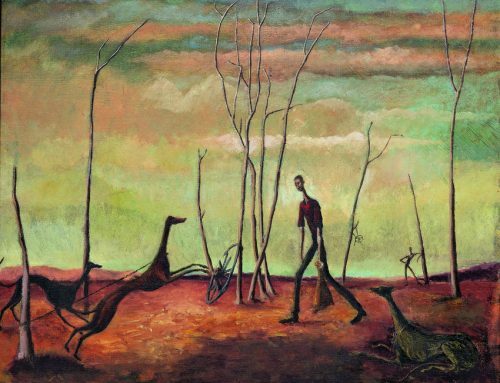 His paintings managed to capture the essence of our great interior as well as the profound connection that many Australians have forged with the bush and the communities that call it home. Born Kevin Charles Hart, Pro Hart grew up on a sheep station, 130km from the isolated outback town of Broken Hill. It was there he began to sketch and paint. 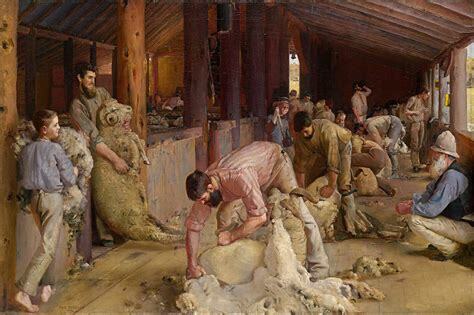 Like many members of the Broken Hill community at the time, Pro became a miner of Zinc and Lead however nothing interfered with his love of art. Many of his paintings were influenced by this particular period of his life. 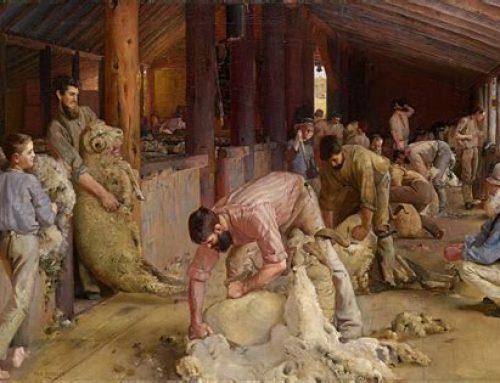 He drew inspiration from the countryside that surrounded him and the people he met while working in the mines. 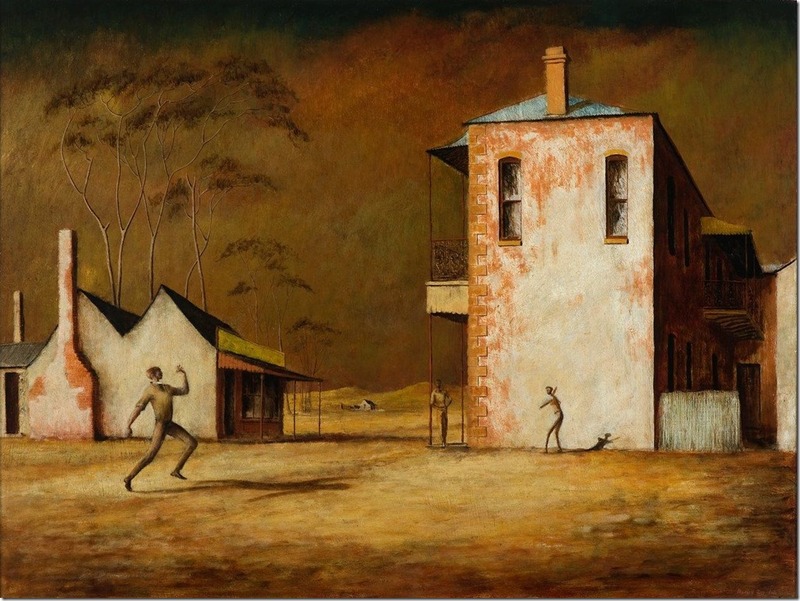 His work can almost be considered as an anecdotal account of a life spent living in a remote Australian town, one that echoes the happenings that many individuals encounter living in the bush. 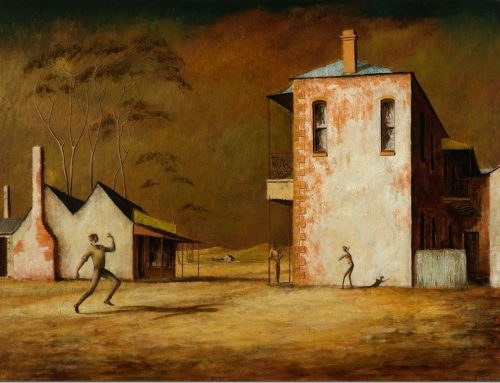 There’s no denying that Pro Hart’s depiction of the Australian landscape and the people who toiled alongside it has helped shape the history of Broken Hill. 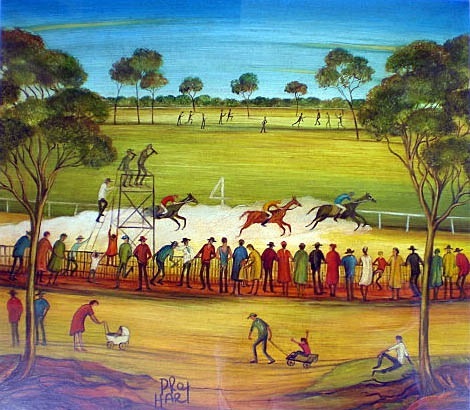 His artwork captures the sense of community of many a bush town, portraying local race meetings, picnics and pubs, all forming a wonderfully realistic story of what it was like living in the outback at that time. 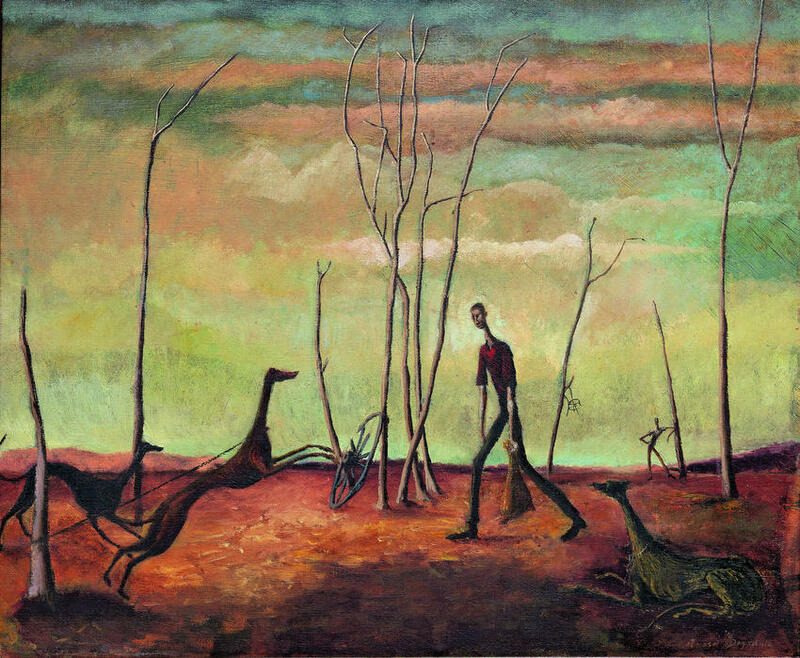 Pro Hart’s techniques were quirky compared to other artists, which may have contributed to him being shirked by some in the art world. He liked to do things differently, and certainly didn’t allow himself to be boxed in by acceptable, conventional methods. The 1980s Stainmaster Carpet advertisement was a great example of his out-there techniques. If anyone could create a work of art by shooting paint from canons or dropping it from air balloons, Pro Hart could. Even at the height of his successful career, Pro Hart maintained down-to-earth, apparently preferring the company of his mates than the celebrities he often rubbed shoulders with. Perhaps it was this modesty that made him so relatable. He may not have reached the upper echelons of the art world, but he was greatly admired. His biography sums him up perfectly, ‘he collected Rolls Royces, Rembrandts and Picassos, but loved Chinese takeaways and a cup of tea’. 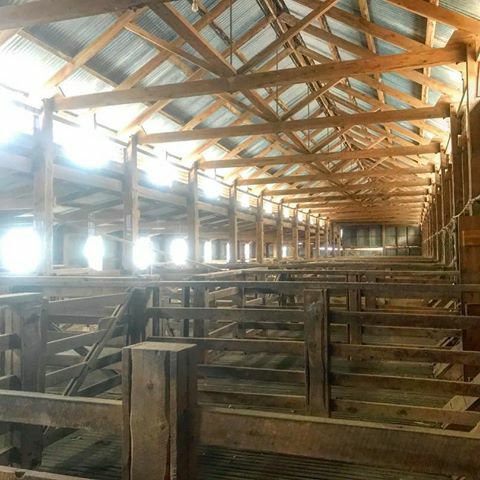 The finest shed in Australia.